Review copy kindly sent to me by Harper Collins . 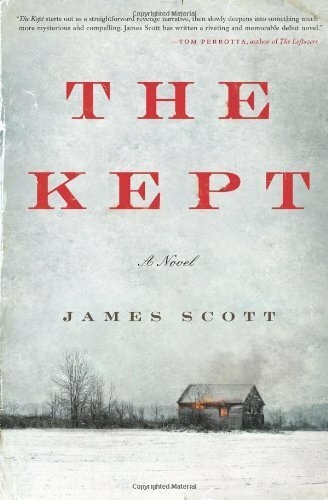 The Kept is a bleak but beautifully crafted story of loss, parenthood and revenge set against a harsh and unforgiving landscape, among hard and unforgiving people, this really is an impressive debut from James Scott. In the tradition of the old westerns, like True Grit, The Kept, is set in the 1890’s among killers, brothel keepers, underage prostitutes and the frontier men and women who struggle to survive. Unlike many of the western type stories so many of us grew up with, James Scott sets his novel – not among the desert plains and cattle driving cowboys – but on the frozen Northern Frontier – during a winter of enormous snowfalls, biting temperatures, Lake Erie frozen solid. The novel’s opening is brave – right away the reader understands they are in for a bumpy ride – as a mother returns to her isolated home to discover the murdered corpses of four of her five children alongside that of her husband. Elspeth Howell is a midwife; she leaves home every few months seeking work, returning weeks or months later to her family. Returning from her latest trip, with gifts in her bag for the children Elspeth makes the heart-breaking discovery that all but one member of her family has been slain by three merciless, unknown killers. One son, twelve year old Caleb, managed to hide in the pantry while the killers carried out their ruthless task. Hearing his mother return, having lived with the corpses of his siblings and father for three days, Caleb fears the men have returned and fires through the pantry door gravelly wounding his mother. Young Caleb must then tend to his mother, slowly helping her to heal, before the two of them set out upon a journey across the frozen country to find the men responsible for the deaths of their family. As soon as Elspeth is up to moving she and Caleb start out upon a perilous journey. Elspeth is a woman fighting demons, the demons which urge her to do things which can only threaten to hurt Caleb further. It is these dark and terrible secrets which brought the killers to their door. Wearing his dead brother’s boots, Caleb is a haunted child, haunted by the memory of his siblings – whose bodies he had to burn – and by the memories of his sometimes difficult relationship with his father. Their journey takes them to the town of Watersbridge – a place Elspeth has reason to fear – a place where her secrets could finally unravel. It is young Caleb –small, illiterate, who had slept in the barn with the animals he was responsible for, more suited to caring for horses than tracking killers, in which the flame of revenge burns most fiercely. While Elspeth, disguises herself from the eyes of Watersbridge, earns money with the Great Lakes Ice Company – and fights the urges that have dogged her, her whole adult life, Caleb associates himself with some of Watersbridge’s hardest men. With Caleb putting himself in harm’s way never has he been more in need of maternal care. I don’t wish to say anything more about the story – for fear of spoiling it for future readers. The story, hangs together beautifully well, as we slowly discover more about Elspeth and the reasons behind the massacre of her family, the motivations of characters make total sense when set against this harsh and brutal world. It is rare to see a child as the seeker of revenge – yet Caleb is a wonderful young hero – there is a touching vulnerability about him, as James Scott never allows him to lose his essential childishness. I suppose there was a part of me that wanted everything to end up a little bit Little House on the Prairie – while recognising that this was unlikely. However the ending we get is more than credible. This is a story of some difficult themes, this is a world of brutality, where children are forced to confront things they would never be today. Yet James Scott’s beautiful prose never lets it become too much – there are several rather gruesome scenes – but it never feels in any way gratuitous. This is a powerful novel, memorable, evocative and wonderfully gripping. I look forward to further offerings from this talented writer. Wonderful review of a wonderful book! I loved this, too. So well-written. Indeed, at the beginning you already know this is not going to be a sweet story. It was all very bleak. Yes. Glad you liked it so much too. It is bleak but not unremittingly so. Great review, Ali. I’ve added this one to my list. I read Gil Adamson’s The Outlander a few years ago which you might also like if you haven’t come across it already. It’s set in Canada at the beginning of the twentieth century and is also about a brave woman coping with the fallout from a terrible crime. Thank you. The Outlander sounds really interesting too. Sounds like a dark but rewarding read – I was never a fan of sanitised Hollywood westerns and this sounds much more realistic! Yes,there is certainly a sense of reality about it. You’ve sold me on this one. Can you also sell me some time to read it?? 🙂 ha! The eternal problem for us readers. Hope you get to read it soon. I too love that cover it is really quite evocative.